If you’re going to work with children on a picture book project, one thing you can be confident about is that it’s not going to end up how you imagine it. I was overjoyed (and slightly nervous) when I was commissioned to write a picture book for Birmingham Children’s Hospital. The brief was great: I would go and work in the hospital school with some children, engaging them in writing and reading for pleasure (I love author visits and working with children), find out about their experiences -of being in hospital, and of their medical conditions (I am always fascinated talking to other people about their lives), and then write a picture book that reflected the lives of children in hospital (I love writing stories, and it was for an excellent cause). …only that didn’t happen. In the weeks that I was at the school, there were both siblings and patients. 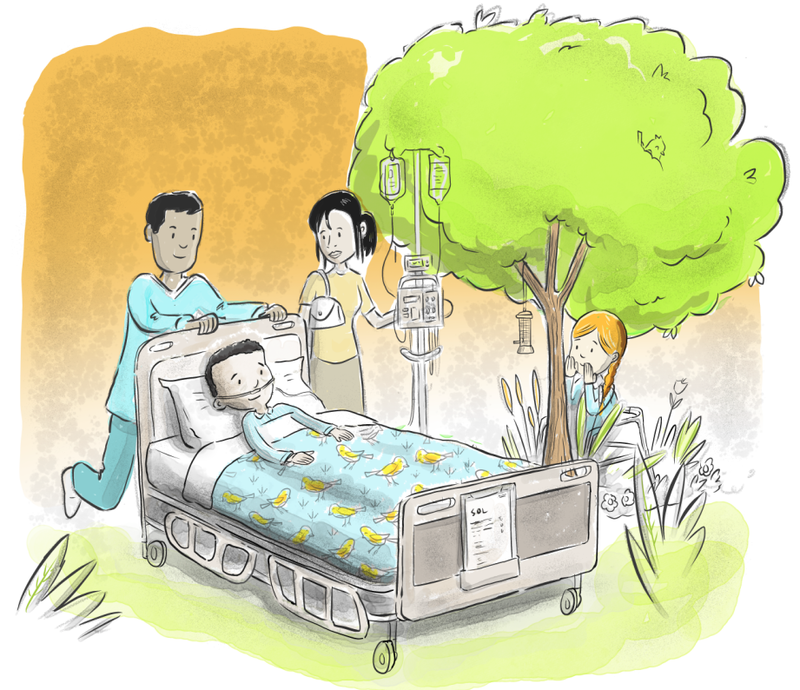 Siblings sometimes stay at the hospital when a brother or sister is very unwell and I soon discovered that neither the siblings nor the patients were interested in talking about why they were there. Which was completely fair enough. This was their reality, and their reality was really tough. They were more interested in doing things that took them away from what was going on in their lives rather than describing it to someone. I was quite thrown by this, initially. However open-minded I'd been about the direction the project might take me in, I'd kind of banked on being able to ask children in the hospital what's your experience of being here? how does it feel? How would I be able to write the most genuine story I could write, set in hospital, without asking the children about their experience of it? 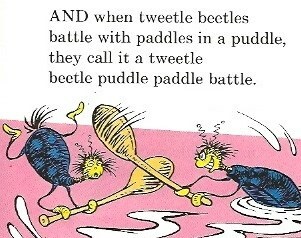 with the epic Tweetle Beetle Battle. If you haven’t read it, do. And so we did. 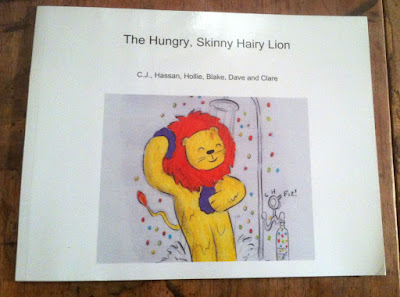 It was a diversion from the actual book project I was meant to be working on, but the children (and I –it was so much fun) loved working on it and less than two weeks’ later, we had our own books of The Hungry Skinny Hairy Lion. Our book project made by the school children, a light-hearted, strange story, full of silly words and phrases that were fun to say out loud (using lulu.com, which is brilliant for projects with children). More from the book project we made in the hospital school. 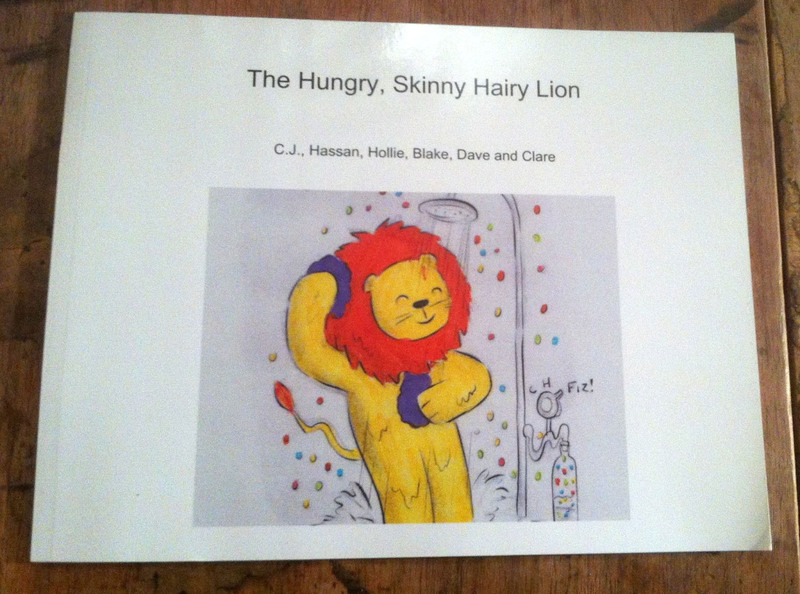 The Hungry Skinny Hairy Lion was never going to be anything like the book I’d write for the hospital, but I learned some really interesting things by doing it (and had loads of fun along the way). The children were interested in good things that might happen in the immediate future; brave characters in stories, and very clearly, distraction. The more wildly I asked them to imagine (using strange props from my magic bag), the more engaged they became. It wasn’t appropriate to use the same kind of silliness and absurdity for the commissioned book, but I learned a lot from making it. So instead of trying to find out more about the conditions of the children who I would be talking to throughout the hospital wards, I focused on finding out what individual children were interested in. I joined children on the wards playing with their superhero collection cards; I talked with children about Eddie Stobart vehicles and chatted with a toy dog that talked (very quietly, through his lovely child owner); we discussed the films and TV programmes and pop music children liked and didn’t like. In short, I had a really enjoyable and often funny time, talking with children about really normal everyday likes and dislikes. Very few children (in the short time I had to visit them) chose to talk about their disability or condition and how it affected them. · Going outside. Some children were indoors for long periods at a time because of their conditions. Lots of children talked about wanting to go in the garden and how they loved being outside. · Distraction. The medical condition of the children was their reality and a fact of life. I didn’t spend time with children who were usually well and who had broken a limb or got a temporary sickness, who may have been happy to talk about something that's so different from their normal everyday life. All the children I spent time with had chronic conditions. So distraction from the sometimes tricky normality was what many of them were interested in. There were lots of conversations which highlighted the children’s great imaginations, and it felt appropriate that fantasy as distraction would become an important element of the book. · Family. Family was clearly extremely important to the children I spent time with. But this often included the idea of a wider family including other adults in the hospital (medical and non-medical staff, and the parents of other children in the hospital, most notably on the renal and dialysis ward, where the families had often grown up together on the ward) as well as fellow patients. The story would not be about sickness or disability at all. Although the book would be set in hospital, there would be no mention of anything medical at any point in the book. The beauty of picture books is that you can have things happening in the pictures that are never mentioned in the text, which felt similar to my experience with the children and young people at the hospital, with children talking animatedly about the latest Fast and Furious film whilst ignoring being attached to life-saving machines. Being unwell and needing treatment was the least interesting thing going on around them. However, the main characters in our story would clearly be unwell and have disabilities. 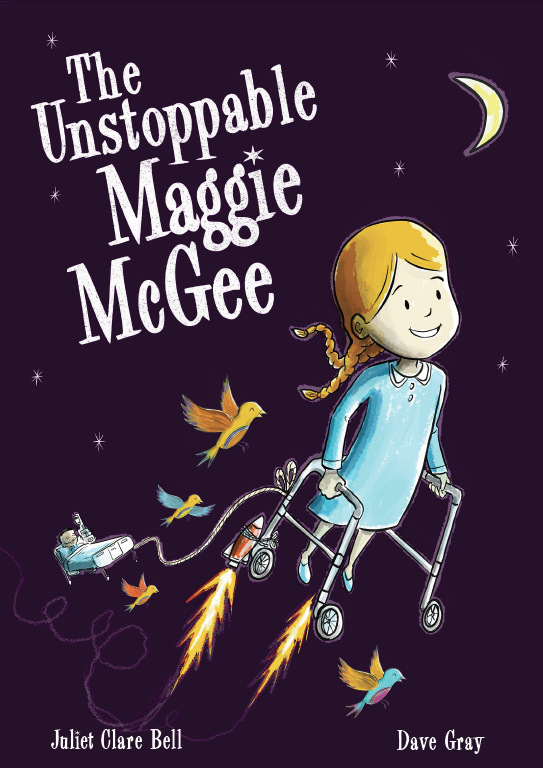 We deliberately went for a front cover that celebrates Maggie, the main character, and her determination, proudly showing her walking frame incorporated into her fantastical imagining. Fantasy would play an important part. After working with children in the hospital, I met with children from some local schools who are used to spending time in hospital but are currently outpatients. These children, who had chronic conditions but were able to lead lives in mainstream schools and mostly out of hospital, were happy to talk about their conditions and also how they distracted themselves when they were sick and/or in hospital. One child told me how he’d distracted himself when he was younger and needed to spend more time in hospital. When he had to put on a mask at night which he didn’t like, he pretended that he was getting ready to go into space. His story stayed with me and became the inspiration behind Maggie. Trying to get out into the garden would be an important part of the story. This reflected what a number of the children I spoke with loved to do when they were able to. Family (in the widest sense) and friendship would be central to the story. And so I set about writing the book. And revising. And revising. And revising. Again. And as an extra perk of the project, I’ve worked closely with the illustrator, Dave Gray, throughout. As other picture book writers will know, writer and illustrator normally have little or no contact during the making of a picture book (kept at arm’s length by the editor and art director) and so it’s been a fascinating process seeing the book come to life picture by picture with Dave's beautiful illustrations. 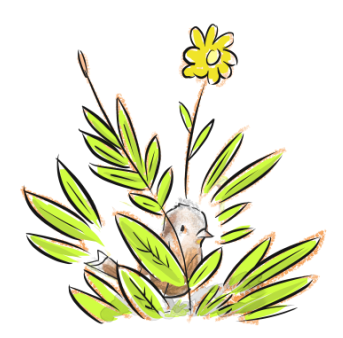 And it’s been much more collaborative than normal, where I’ve altered text when I've seen what Dave has done with various illustrations, and we've both suggested changes to each other's work. It’s felt very different from a normal author-illustrator relationship, compounded by the very much shorter than normal timescale for the book. It’s been an amazing and challenging project. I’ve met and worked with amazing children, parents and staff over the past six months and my life has been enriched by the experience. And I’ve loved the challenge: to create a book that children will relate to and enjoy, regardless of whether or not they have personal experience of sickness, disability or being in hospital; to make the reader appreciate that what might seem small goals to some children are really big goals to others; to portray children with disability and sickness who are rarely represented in children’s books, in a positive and wholly un-patronising way; and create something that will raise money for Birmingham Children’s Hospital Magnolia House Appeal. We’ll find out soon whether we’ve managed that, but it’s been a real privilege to be part of it. For writers and illustrators out there, what have been your most interesting commissions? 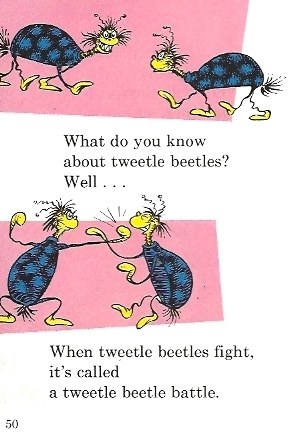 And I’d love to hear from anyone about picture books they like that have characters with disabilities. Please share your favourite books with us in the comments section below. The Unstoppable Maggie McGee by Juliet Clare Bell and Dave Gray will be out on November 11th, 2015. Unusually, because The Wesleyan (Birmingham Children’s Hospital’s biggest sponsor) have absorbed all the costs of creating and printing the book, every penny of the £6 it costs to buy the book goes to the hospital’s Magnolia House Appeal. Love this post and can't wait to read the book! I can't wait to buy the book. It looks great and I will definitely get it. A lovely sensitive post about how your picture book idea grew and became the finished article. 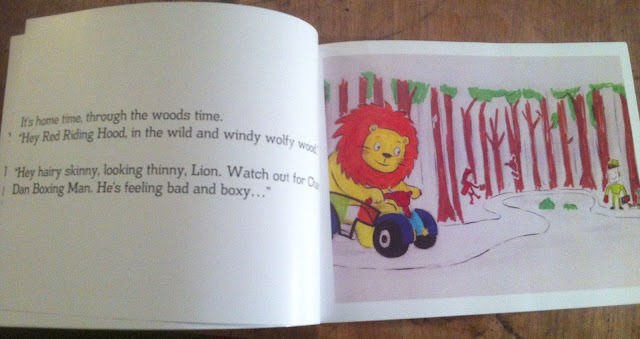 And I love the the Hungry Skinny Hairy Lion, too. It looks brilliant. 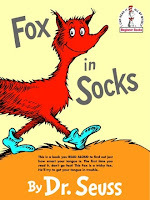 The charity Scope have a useful list of picture books that feature children with disabilities. being a parent of one myself, however, I must admit I would rather read books that escape the whole thing. I like the fact that you did not mention illness in the book but instead concentrated on what your readers wanted. Thanks, Moira and it's really interesting to hear your thoughts from a parent's point of view. It's been a fantastic project and I'll be sure to check out the Scope list. Clare - this made me cry! What a superb blog post and what a terrific project - very best of luck! It really has been an amazing project and it does feel like a huge collaboration -with children, parents, hospital staff, Wesleyan staff (who've sponsored the whole thing), Dave the illustrator and others. I hope you'll like the book! Thanks, Nick. What a fantastic project and gorgeous book. 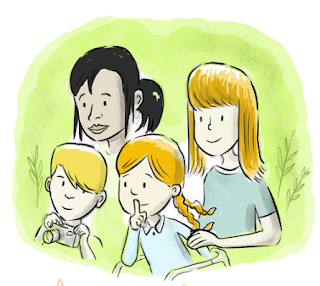 To know the process by which you captured the children's imagination is very moving and the result is a wonderful book that celebrates children being themselves, regardless of their health circumstances. Can't wait to read it! "...celebrat[ing] children being themselves" is what it's all about. Thank you, Marianna! Many thanks for a truly heart-warming post - it's kicked off my day perfectly! I love the honesty of children and it's fantastic that you've been able to truly understand and tap in to what they really want, as opposed to what we think they may want. I've just finished reading Wonder by RJ Palacio, which is a fantastic read and allows you to really empathise with the MC. Children with chronic conditions can be so incredibly brave without knowing it, and have so much to teach the rest of us. I wish you all the very best with this and hope to read it shortly! Thank you, Zoe. I also really liked Wonder. I feel hugely privileged to have worked with the wonderful children and families (and staff, many of whom are absolutely seen as being family) I met during the project. I hope you like the book! Hi Clare, it's been truly fascinating following the project from conception to completion and I'm really looking forward to reading my signed copy! Work colleagues in the Library Service are also very interested as we are looking for more sensitively written books featuring disability. See you tonight! Thanks, Ali. It's great that your colleagues from the Library Service are interested, too. Thanks for everything. Clare. This is a wonderful post, Clare. How I would love to work with children as you have done! I really can't wait to buy your book! It's been a real privilege, Addy, and a wonderful commission. What a lovely experience and the story, Clare. Will buy your book and share with children. God Bless. Thank you, Susmita. It will be on sale at the conference if you wanted to wait and get one there... I can't believe it's out so soon! I found this so interesting. Thank you and I'll look out for the book! Thank you, Odette. I can't quite believe it's going to be out in less than four weeks' time... It's been an incredibly fast turnaround for a picture book, which is both scary and exhilarating! Hi, Juliet. I'm Nancy from Indonesia. I found your creative experience really wonderful. Writing based on intense contact with children with illness, to find out hhat they do have hope, the spirit of joy, and love towards nature, friends and family. The front cover looks amaxing, too. It was fo me love at the first sight. Well done, Juliet and Dave! Best wishes to both of you! What a lovely message, Nancy! Thank you very much. It's been such a wonderful project and I've learned so much from it, including learning more about myself and assumptions (however small or well-intentioned) I might make. Very best wishes to you, too, out in Indonesia! Clare. Clare, it has been a pleasure to work with you on this project, I have loved every minute of it! I am so pleased that the orders for the book are now coming in and I really look forward to the event next week.